WELCOME TO 2015 !! - Darlynn's Darlins Inc. In SPRING of 2013...yes, that would be correct, 2013, the water well started to collapse...started taking on sand...providing water that looked like milk. 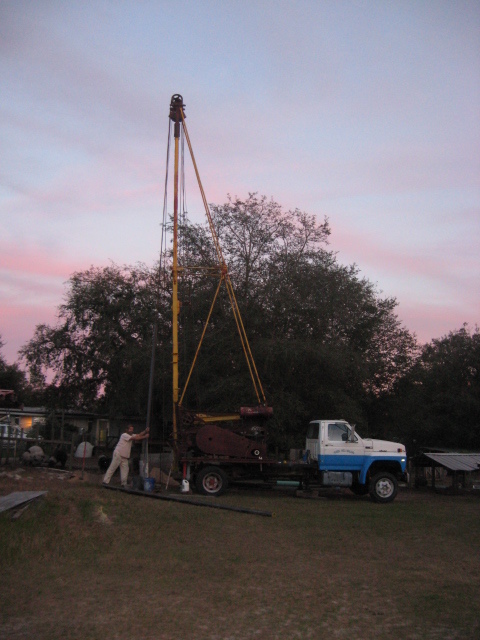 The well man came out and said I was on borrowed time for sure and the only option available was to drill a new well. Set up a fundraiser with GoFundMe in July of 2013, to see if we couldn't get some financial help to get a new well drilled since the 200+ animals that live here have to have water, I wasn't interested in making the 11 o'clock news for abuse or neglect, and we NEVER have had anything close to $4700 just laying around. A year and a half went by on that borrowed time while I watched others raise thousands of $$ for honeymoons, vacations, and various other non essentials and wondered what it is exactly that makes people feel like donating to a honeymoon or vacation is a better use of their hard earned money than donating to a well to provide water to 200+ rescued animals. And tax deductible at that. FINALLY, just after Thanksgiving 2014, we had received enough donations to get the new well started. Silly me didn't stop to realize that GoFundMe and WePay were going to take their cuts which between them would have us almost 10% short of what we needed. Opened the fundraiser back up with a higher goal...don't you just know THAT raised some eyebrows. Long story short, finally raised the rest after lengthy explanations and the new well was drilled in the the days right before Christmas. I paid the man, who is an honest man, and he went on vacation the day after Christmas with his son. Because I have always been so rife with good luck (not), don't you know I had the same kind of water I had coming from the old well only a helluva lot more of it (4" well instead of the old 2" well). It cleared, turned milky and rusty, cleared, turned milky and rusty almost every other day. I was freaking out...lotta money to have not solved the freakin' problem is what I was thinking. Long story short again...the well man had to come back after Christmas and drill the well deeper. I FINALLY have water...clean, clear water. Lots of water. We can actually run a couple of hoses outside at the same time AND wash dishes or do laundry or take a shower. So my 2015 New Year's Resolution is to resume showering every Saturday whether I need to or not. Что такое пулы чтобы майнинга, будто они работают? Подборка тут. Хорошая и короткая статья. избрание кажется теперь настоящий актуальный- это Монеро - а пулы из легких- Майнергейт судя из этой статьи. Share the adventure of using the gamepads on which you played. Interesting gamepads that are universal for android and PC. Gamepad looking for retro gaming on nes sega emulators. Õàó ëþäè! ïðèîáðåë ñåáå PS4! Íåìíîãî îôàíàðåë îò öåíû íà èãðû ïî 4000 òûùè óâèäåë êòî òî ïðèñûëàë ìàãàçèí äåøåâûõ àêêàóíòîâ ps4 ïîêóïàëè âû çäåñü???? Поэтому в любой ситуации самый правильный шаг — диагностика. Вы узнаете, сколько будут стоить ремонт iPhone в Москве работы с необходимыми запчастями и примете верное решение. Мы работаем как с актуальными телефонами Apple, так и со снятыми с производства. coincide con la amenaza de huelga expresada por los trabajadores de Renfe si no llegan maquinistas.es que el libre comercio está en el ADN de la Unión Europea y el bloque comunitario lo defenderá independientemente de los planteamientos del nuevo presidente de Estados Unidos, Donald Trump.Según las proyecciones de Kiodo, el Partido Liberal Demócrata (PLD) de Abe y el Nuevo . El buen resultado de los castellanos y leoneses se cimentó en los campeonatos de Españ.más informaciónBayern, Juventus y Leicester, rivales de Madrid, Barça y Atl&eac. El 4-0 de París recuerda al vivido en Atenas, aquel ante el Milan de Capello y que supuso la destrucción del ‘Dream Team’ de Johan Cruyff en 1994.
векторная графика в photoshop - секреты инструментов фотошопа, спецэффекты для фото. Los turistas mantienen el ritmo habitual y la ciudad hierve, como siempre en julio, sobre todo en un.Entre enero y septiembre, Iberdrola efectuó inversiones por valor de 3.el crédito con altas tasas de incumplimiento en los pagos, el desempleo aumentando, alerta el experto. “Confiamos en que la decisión de Rosa Valdeón implique una reflexión dent.) y a la del Madrid, que me demuestra su cariño día a día, agrega. Eso hizo Zinedine Zidane, que utilizó el campeonato doméstico como banco de pruebas y .